Crafts styling and Asian design influence. - Upcoming show: Smithsonian Craft Show, National Building Museum, April 25-28. Preview night, April 24. - PLEASE NOTE; all purchases will need to be made by using the "Contact" form under the "More" button. Just let me know what you are interested in and I will let you know what I have in stock. - Some of my work was recently published in the book The Delmarva School of Art by Dana Kester-McCabe. It is available for purchase through Amazon. My goal is to design a piece that can bridge between fine craft and fine art. With this as a guiding principle, I focus on the true beauty of natural wood while providing an object with practical functional use. The challenge is making these objects more than their function by making them art worthy of display and to inspire discussion. One reviewer described my work as using the principles of “Ikebana” applied to woodworking. The reviewer noted the serenity achieved by the minimalist nature of my objects and use of shape, line and form. Once every 3 years the Biggs holds a Masterworks competition. The competition was held in November 2017. Michael was named Best In Show for "Ocean View" and received a purchase prize to have the box become part of the permanent collection of the Biggs Museum. The judge for the show was Leslie Mounaime, Target Gallery Director of the Torpedo Factory Art Center in Alexandria, VA.
Michael was selected to build the Governor's Award for the Arts in 2014. The award is given to outstanding contributors to the Arts in Delaware. 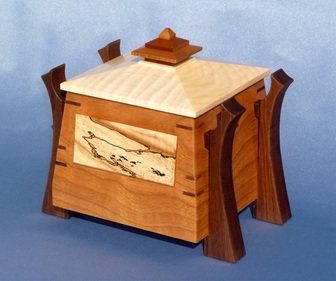 It is a "Treasure Box" in an Asian Design with an applied piece of Curly Spalted Maple reminiscent of an estuary "Landscape" in Delaware. The box at left is one of eight built for the awards. Michael Quattrociocchi is an award winning wood craft artisan. He started working with wood when he was 9 years old in a shop that was shared by his father and uncles. Much of the basics of woodworking were taught by his father. Through reading books by authors such as Tage Frid and James Krenov, he tried out different joinery techniques to refine his craft. Michael worked for Lockheed Martin for 25 years and recently retired to Milford, DE to devote his time to woodworking. Michael exhibits at juried art shows throughout the Northeast. He has exhibited at the Biggs Museum of American Art and has items available at the Rehoboth Art League in Rehoboth Beach, DE and at Gallery 37 in DE. 2018 - Published in the book The Delmarva School of Art, by Dana Kester-McCabe. 2017 - Awarded "Master of His Craft" by the Biggs Museum of American Art - Exhibition November 3rd, 2017 through January 21st, 2018. 2016 - NPR interview for Delmarva Almanac - broadcast September 17, 2016. 2015 - Delaware State Arts Council - Appointed by the Governor of Delaware to serve a 3 year term, July 20, 2015. 2015 - Biggs Museum of American Art, "Masters 2015" - Selected as a Masterworks Artist. Exhibition, April 3 - June 14, 2015. Judge - Brandi P. Clark, Executive Director of the Pennsylvania Guild of Craftsmen. Judge - Susan Holt, the Gallery Director and Instructor of Fine Arts at the University of Maryland, Eastern Shore. MFA, B.F.A. - "Award of Distinction" at 42nd Annual Syracuse Arts and Crafts Festival. - 46th Annual Outdoor Fine Arts and Fine Crafts Show, Rehoboth Art League, first two weekends in August.